The San Francisco band, Tomihira, are close to finishing up their debut recording, Play Dead. But until it sees the light of day, they have kindly put up remastered and remixed versions of the mp3s on their site. And as Dean (pictured left above) says himself, they are 'just plain better', and I agree. I have written about the band previously and below is part of what I said. If you follow this link you will find the original post and an interview I did with Dean Tomihira. I've said it before (because it's true), 'the best songs are sad songs' - the ones that pluck and strum the minor chords of your life. The band, Tomihira, led by Dean Tomihira (vocals and guitar) and ably bolstered by the talented pair of Markkus Rovito (drums and percussion) and Chris Zaballos (bass), deliver these songs. Songs with the melancholy thrum and ache of guitar matched by the Pacific Ocean blue of Dean Tomihira's vocals. 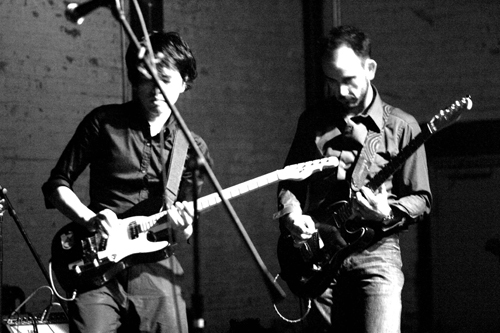 Put simply... Tomihira is West Coast electric melancholia, beautifully controlled and arranged. Go here for a couple more mp3s, info on the band, tour dates, and news. excellent music! i'm looking forward to their cd coming out.